The simplest and most economical voice mail. 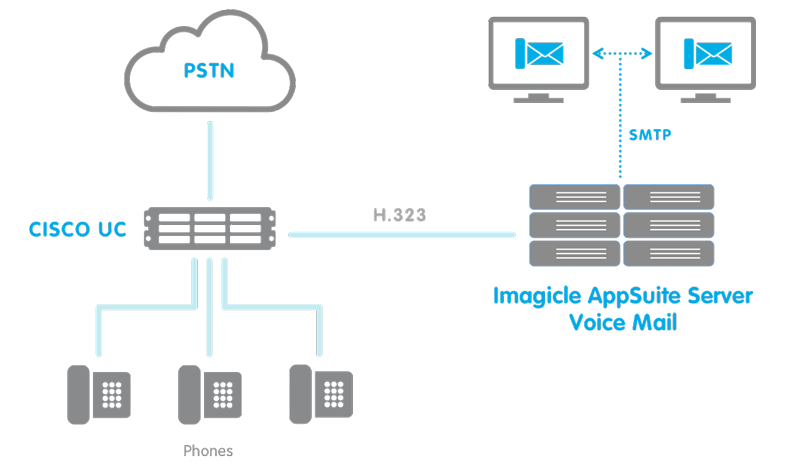 SSAM is a Unified Messaging system designed to be integrated in your Cisco UC platform and extend its functions. It collects your phone messages when you can't answer the phone, and notifies you via e-mail and with the MWI on your IP-Phone. It lets you add personal welcome messages and forward messages to other voice mail boxes. It's ideal when you want to use more applications but your resources are limited, because it uses the same Virtual Machine dedicated to Imagicle ApplicationSuite along with all the other applications. Collects and manages telephone messages when you can't answer the phone. you can't take a call. Access telephone messages with a personal PIN or password on the web area. 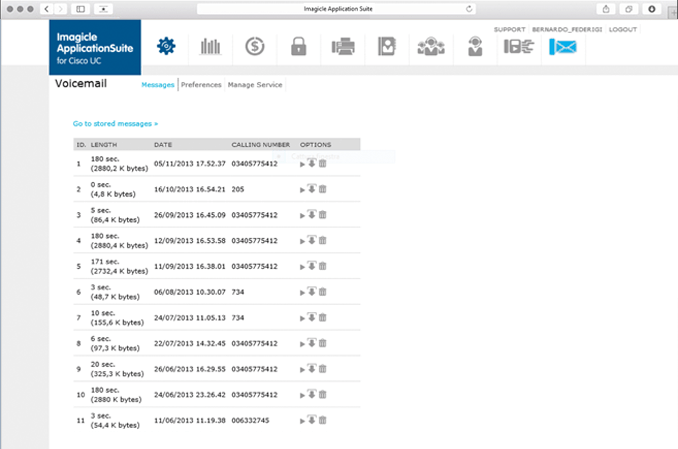 Manage messages on the convenient Imagicle ApplicationSuite web interface. Receive new messages as audio file attachments in your e-mail inbox. Up to 48 channels per instance (physical or virtual). Multiple instances supported. Unlimited users. High recording capacity (e.g. 1,125,000 minutes with 20 GB). PIN protection. Supports visual notifications on IP phone. Complete management system via telephone to personalize the voice mail box and welcome messages. The most important calls always seem to arrive when you're out of the office, and often, you're not even aware of them. Not everyone can have a precise and reliable secretary ready and willing to note every single contact. With Imagicle Voice Mail, it doesn't matter if you're not at your desk or if you're taking another call, a personalized welcome message greets your caller, inviting him or her to leave a message. Then, you can listen to all of your messages at any time from your desk phone, the dedicated web area or in e-mail as an attached audio file. Receive calls you can't answer with any message you wish. 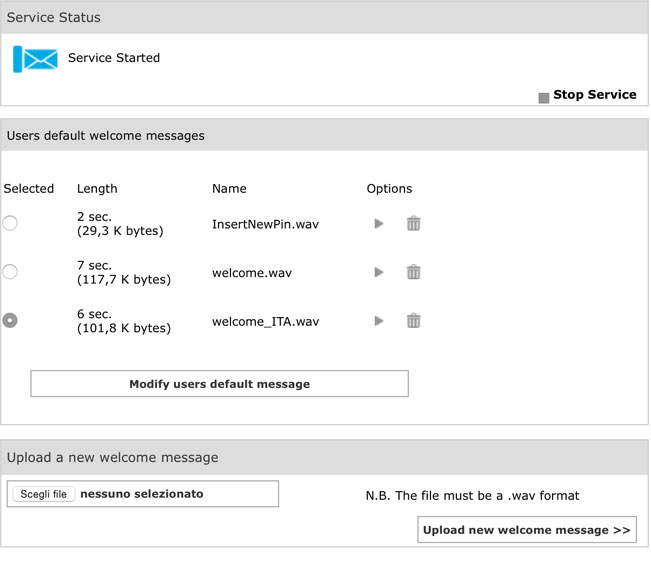 Upload your personal welcome messages in .wav format from the web interface. With a click, you can change the default message at any time. Access your messages, which are protected with a PIN, directly from your office phone or any other landline phone or cell phone, by calling a dedicated number. SSAM also manages Message Waiting Indicators (MWI) on Cisco IP phones, indicating the presence of unheard messages. The status is always synchronized independently of the various ways in which you consult your messages (web and phone). The telephone's indicator light is lit when one or more messages have been received. You can listen to the messages, scroll through them, save or delete them. You can listen to your messages using the convenient Imagicle ApplicationSuite web interface. With a click, you decide whether to archive messages so that you can listen to them again, or to delete them. Directly to your E-mail box. For ultimate convenience, you can also receive your messages in your e-mail inbox. The attached .wav audio file contains the message left in your voice mail. With over $5 billion in sales and a portfolio of some 1,000 products, one of the three largest pharmaceutical firms producing generic drugs in the world chose Imagicle to manage its incoming calls. Mylan chose to improve its customer service by providing its operators with the Imagicle operator's solution paired with the ACD solution to correctly direct calls received from the Cisco UCM system. Missed calls have been eliminated and the time customers spend on hold significantly reduced. 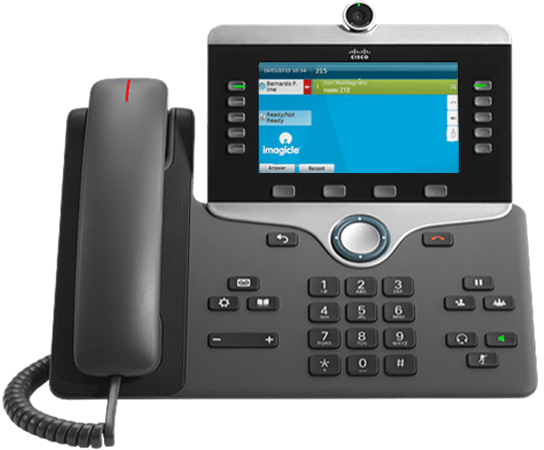 SSAM can connect with the Cisco UC system using the H.323 protocol to receive unanswered calls and record messages which are then sent to the user's voice mail box, and sent, if requested, to the e-mail address via standard SMTP protocol. Optionally, SSAM supports high reliability with an additional server that can also be used as a backup with directories automatically synchronized between the servers. 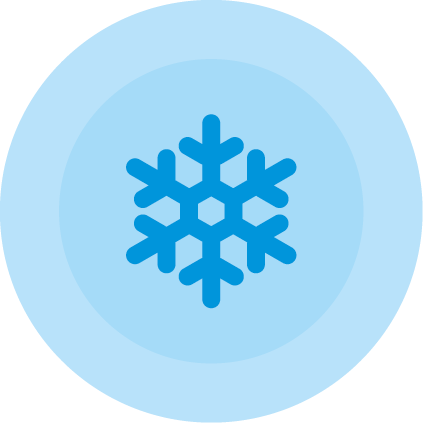 The servers are based on auto-synchronized databases that can also run in disaster recovery environments (on a WAN) with no need for any manual operations for failover or failback.